Timely screening and management of oral conditions among patients with type II DM will help prevent dental and gingival complications, lead to patient satisfaction and improve overall health outcome. The state of Qatar, over the past three decades of economic transition, has witnessed a rapid rise in cardiovascular morbidity and mortality mainly due to diabetes. According to the International Diabetes Federation, Qatar has a national diabetes prevalence of 20.4% (Diabetes Atlas More Details Fifth Edition, International Diabetes Federation, 2003),, making the disease an epidemic and a national health and economic burden. Two recent studies were carried out in Sultanate of Oman and Saudi Arabia showing a higher prevalence of periodontal disease compared to the European countries among the general adult population., Till recently, dental care was not part of standards of practice among patients with diabetes in Qatar. Diabetes is a common disorder with concomitant acute and chronic complications including oral manifestations which may include but not limited to gingivitis, periodontitis candidiasis, tooth loss, foul smell of the mouth, dental caries, xerostomia, tooth loss, lichen planus, burning mouth syndrome, salivary dysfunction, and taste impairment. Periodontitis is a relatively common and chronic condition of the tooth-supporting tissue secondary to bacterial deposits aggregating on tooth surface leading to plaque formation., Systemic inflammation-induced by periodontitis has been shown to aggravate systemic diseases including diabetes and cardiovascular system manifested in the buildup of athermanous plaques., Atherosclerosis is a slowly evolving process characterized by systemic inflammatory manifestations. The prevalence of oral pathology and especially periodontitis remains unknown among patients with type II diabetes in Qatar. Uncontrolled diabetes coupled with bacterial infections may negatively impact the treatment of periodontitis. Dental implants have a lower success rate among patients with type II diabetes. Therefore, a vicious circle may ensue if poorly controlled diabetes is coupled with chronic periodontitis. The aim of this study was to estimate the prevalence of oral pathology among patients with type II diabetes living in Qatar. A cross-sectional survey was carried out for 1 year from May 1 to February 2, 2014, at Um Gwailinah Health Center, Doha, Qatar. The World Health Organization's (WHO) community periodontal index (CPI) was used in our study by qualified dentists to assess periodontal status among participants. Dental caries was evaluated using the decayed, missing, and filled teeth (DMFT) index according to the WHO criteria, 1997. Ethical clearance was obtained from Hamad Medical Corporation (Medical Research Center, research proposal 11030/11). The study population consisted of adult patients with type II diabetes attending um Gwailinah health center. Respondents were selected via a stratified sampling technique followed by a clinical oral examination. Inclusion criteria included adult patients with type II diabetes. Exclusion criteria included individuals refusing to give consent, cancer or severely debilitating illness, documented alcohol, and drug abuse. A structured open-ended and closed-ended questionnaire was used to collect data including sociodemographic data, general health status, past medical history, comorbidities, medication intake, and any past dental history along with a questionnaire for recording clinical examination findings. An informed consent form was signed by the participants before inclusion in the study under bright light. Oral examination was carried out under bright light assessing the oral soft tissues and hard tissues including dental implants or appliances present. It was utilized to assess the impact of dental caries on the teeth; we classified each tooth in one of: D denoting tooth decay. M denoting missing tooth either as a result of tooth extraction or other reasons. F denoting filled tooth as any tooth that has a permanent filling intact with no sign of caries lesion. N is the number of participants examined. DMF index = D+M+F/N+. It was utilized to assess the periodontal status of the participants. It involves using a periodontal probe to evaluate all the teeth after dividing the mouth into six sextants. Each sextant should consist of at least two functional teeth (i.e., nonextracted teeth). Toothless sextants with just a functional tooth were considered absent and marked with “X” on the data captured sheet. 4 = pocket depth >6 mm. Data obtained were analyzed using Statistical Package for Social Sciences Computer Software (SPSS 21.0, Inc., Chicago, USA). The statistical test used was the Chi-square with the significance level of P ≤ 0.05. During the study, the response rate was 95%; 180 participants aged between 35 and 75 years, with a mean age of 54 years, of which 63 (35%) males and 117 (65%) females. Study population were 85 (47.2%) of the participants were government workers, 62 (34.4%) were home makers, and 33 (18.3%) were laborers. 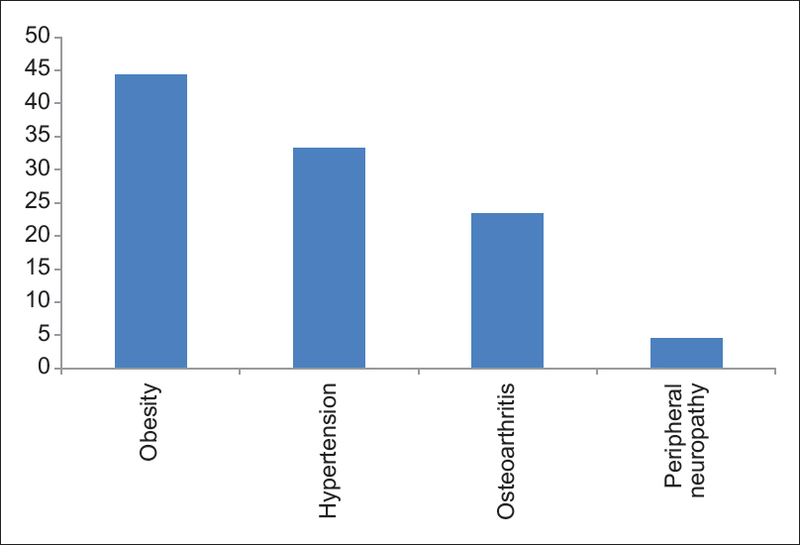 Obesity 80 (44.4%), hypertension 60 (33.3%), osteoarthritis 42 (23.3%), and peripheral neuropathy 38 (21.1%) [Figure 1]. 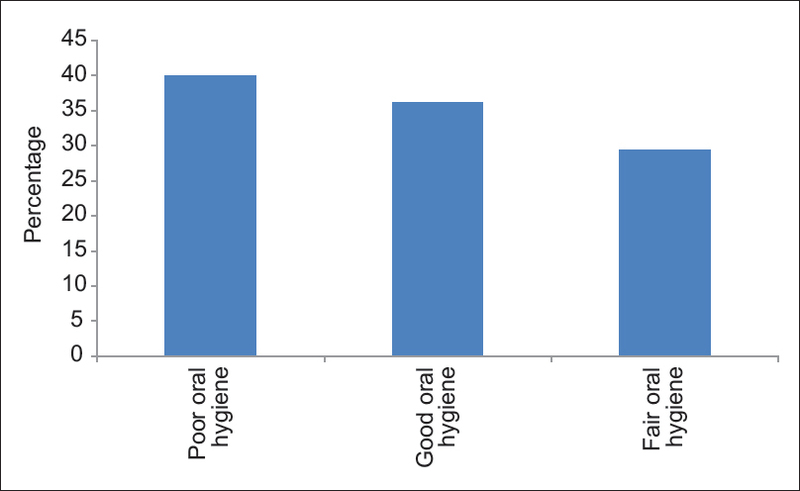 More than a third 72 (40%) of the participants had poor oral hygiene, 65 (36.1%) had good oral hygiene, and 53 (29.4%) were fair. More than a third of participants (39.1%) presented with plaque after scrabbling, the majority (43.4%) had visible dental plaque, and 14.6% had abundant plaque [Figure 2]. Two-third 120 (66.6%) had gingivitis, 71 (39%) periodontitis, 66 (36.6%) dental caries, and 19 (10.5%) tooth wear [Table 1]. 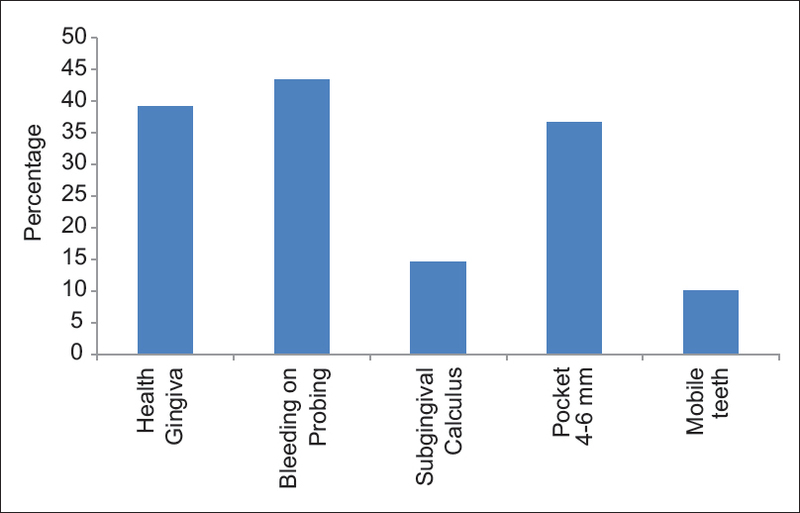 A total of 49 (36.6%) participants had periodontal pocket of 4–6 mm, eighteen (10%) had mobile teeth, 43% bleeding on probing, and 14% subgingival calculus [Figure 3]. More than a third 54 (33%) did not have any carious tooth, 12 (14%) had one missing tooth, and 11 (16%) had two missing teeth. More than a third 46.6 (38.3%) of the patients had one tooth missing, 14 (19.6%) have lost two teeth, and 19 (9.3%) had more than three missing teeth. With regards to filled teeth, around 52 (29%) had filled teeth see [Table 2]. The majority of participants had dental caries 136 (75, 6%), 113 (63, 1%) had missing teeth, and 27 (15%) had teeth with total crown destruction. The mean DMF index was 6.3. The oral hygiene status of the study participants is far below standards. It is worth noting that dental services at primary health-care centers in Qatar is almost free, near to our patient living places and only 2%–5% of medication actual price is incurred on the patient. However effective patient education, the culture of routine dental visits is not practiced in Qatar. Similar to studies in Africa and Europe, patients usually visit the clinic only when they have pain or an emergency dental problem,, This can be partly explained by the phobia of visiting the dentists where the pain is almost guaranteed in any intervention. Furthermore, the silent and prolonged nature of dental caries and periodontal disease make patients wait for long periods until pain strikes or foul odor of the mouth is noticed by family members or friends. Similar to other studies in neighboring countries and Asian countries including Vietnam, there was poor periodontal status among our participants manifested in high calculus deposits and a high percentage of periodontal pockets of 4–6 mm. Lack of brushing, inappropriate brushing technique, poor oral hygiene, and lack of regular dental follow-up are few reasons behind the current situation. Uncontrolled diabetes, on the other hand, is a major factor contributing to the poor periodontal status in our patients. A recent meta-analysis of four studies concluded that individuals with diabetes have a 2-fold higher risk of developing the periodontal disease compared to those without diabetes. In individuals with type II diabetes, the host inflammatory response seems to be the critical factor for susceptibility to and severity of periodontitis., Similarly, there is evidence to suggest that periodontitis-induced bacteremia will cause increased levels of reactive oxygen species and serum proinflammatory cytokines, leading to increased insulin resistance. Qatar, over the past 2 years has established an almost 95% paperless digital records and coupled with the American Diabetes Association guidelines which are the official guidelines adhered to by family physicians practicing in Qatar may tilt the balance in favor of a more proactive health-care delivery similar to screening for retinal and renal diseases. Similar to studies elsewhere including Africa and Europe, our study revealed a rather high mean DMFT score, along with a high prevalence of tooth decay.,,, However, the prevalence of tooth decay is not uniform in developed countries. Canada, for example, has a low prevalence of tooth decay compared to Norway. Many factors may influence this discrepancy in the prevalence of tooth decay including the level of education, fluoridation of water, access to oral health facilities, electronic versus paper files system, recall systems, medical insurance and reimbursement, dietary habits, and genetic factors. Recent data have revealed the association between tooth loss, periodontal disease, and many systemic diseases including diabetes, cancer, and cardiovascular disease. Our data revealed a high level of periodontal in accordance with other studies worldwide, especially in older populations., Estimates of the Global prevalence of severe periodontal disease may vary from 10% to 15%, although up to 90% of individuals may be affected by the milder periodontal disease, including gingivitis.,,, Many factors may contribute to the development of periodontal disease including race, aging population, gender, obesity,, smoking, and nutrition. In addition, limited adult periodontitis suggests that approximately one-half of cases may be heritable. 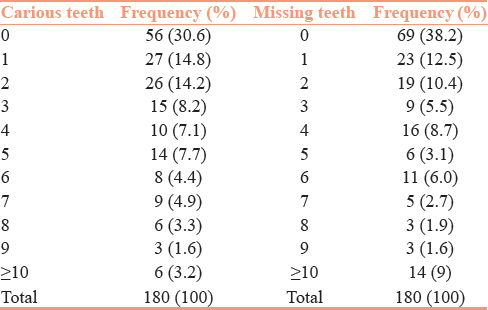 The proportion of patients with missing teeth our study is high as compared to another study conducted out in France where the proportion of edentulousness was 26.9%. This could be because of the high prevalence of diabetes, obesity in Qatar, where type II diabetes has reached almost 20.4% and obesity 40% along with lack of proper oral hygiene and periodic recall for the screening of periodontal diseases. The booming population of Qatar along with the high influx of expatriates place a huge burden on dental services in the country leading to long delays in dental appointments in tertiary care which make affluent people and those with medical insurance seek private treatment, whereas those with low socioeconomic status have to wait for long periods of time to be seen in tertiary dental care. This delay undoubtedly leads to worsening of the situation of periodontal status, especially in those with diabetes. Furthermore, the impact of DM on periodontal disease has been shown to be independent of other major risk factors. The high prevalence of periodontal disease in our study is alarming, especially when coupled with systemic diseases such as metabolic syndrome and cardiovascular disease. This finding should prompt stakeholders into designing a more proactive dental care involving effective dental education, optimal glycemic control, weight reduction, and periodic screening for dental status among patients with type II diabetes, especially nowadays where an electronic system is currently in place. Al-Harthi LS, Cullinan MP, Leichter JW, Thomson WM. Periodontal diseases in an Omani adult population: A preliminary study. J Periodontol 2014;85:e104-10. Idrees MM, Azzeghaiby SN, Hammad MM, Kujan OB. Prevalence and severity of plaque-induced gingivitis in a Saudi adult population. Saudi Med J 2014;35:1373-7. Mohamed H, Al Lenjawi B, Al Hamadani ZF, Alkhmour H, Ali MA, Shaltouni S, et al. Prevalence and correlates of diabetic peripheral neuropathy in a newly developing country: A cross-sectional study. J Diabetic Foot Complications 2016;8:31-7. Weinspach K, Staufenbiel I, Memenga-Nicksch S, Ernst S, Geurtsen W, Günay H, et al. Level of information about the relationship between diabetes mellitus and periodontitis – Results from a nationwide diabetes information program. Eur J Med Res 2013;18:6. Genco R, Offenbacher S, Beck J. Periodontal disease and cardiovascular disease: Epidemiology and possible mechanisms. J Am Dent Assoc 2002;133Suppl:14S-22S. Hupp JR. Ischemic heart disease: Dental management considerations. Dent Clin North Am 2006;50:483-91, v.
Persson GR, Persson RE. Cardiovascular disease and periodontitis: An update on the associations and risk. J Clin Periodontol 2008;35:362-79. Javed F, Romanos GE. Impact of diabetes mellitus and glycemic control on the osseointegration of dental implants: A systematic literature review. J Periodontol 2009;80:1719-30. Agbor AM, Naidoo S. Knowledge and practice of traditional healers in oral health in the Bui division, Cameroon. J Ethnobiol Ethnomed 2011;7:6. Macqueron N. L'etat Bucco-Dentaire Dans les EHPAD en France. Thesis in Dental Surgery; 2013. Vatsana C. The Oral Health of Elderly Population in Vietnam. Thesesodonto-Stomatologie; 1989. Al-Shammari KF, Al-Khabbaz AK, Al-Ansari JM, Neiva R, Wang HL. Risk indicators for tooth loss due to periodontal disease. J Periodontol 2005;76:1910-8. Leite RS, Marlow NM, Fernandes JK. Oral Health and Type 2 Diabetes. The American Journal of the Medical Sciences 2013;345:271-3. Kapp JM, Boren SA, Yun S, LeMaster J. Diabetes and tooth loss in a national sample of dentate adults reporting annual dental visits. Prev Chronic Dis 2007;4:A59. Oliver RC, Tervonen T. Periodontitis and tooth loss: Comparing diabetics with the general population. J Am Dent Assoc 1993;124:71-6. Papapanou PN. Periodontal diseases: Epidemiology. Ann Periodontol 1996;1:1-36. Eke PI, Dye BA, Wei L, Thornton-Evans GO, Genco RJ; CDC Periodontal Disease Surveillance Workgroup: James Beck (University of North Carolina, Chapel Hill, USA), Gordon Douglass (Past President, American Academy of Periodontology), Roy Page University of Washin, et al. Prevalence of periodontitis in adults in the United States: 2009 and 2010. J Dent Res 2012;91:914-20. Fernandes JK, Wiegand RE, Salinas CF, Grossi SG, Sanders JJ, Lopes-Virella MF, et al. Periodontal disease status in Gullah African Americans with type 2 diabetes living in South Carolina. J Periodontol 2009;80:1062-8. Kaur G, Holtfreter B, Rathmann W, Schwahn C, Wallaschofski H, Schipf S, et al. Association between type 1 and type 2 diabetes with periodontal disease and tooth loss. Journal of clinical periodontology 2009;36:765-74. Lalla E, Papapanou PN. Diabetes mellitus and periodontitis: A tale of two common interrelated diseases. Nat Rev Endocrinol 2011;7:738-48. Lakschevitz F, Aboodi G, Tenenbaum H, Glogauer M. Diabetes and periodontal diseases: Interplay and links. Curr Diabetes Rev 2011;7:433-9. Hugoson A, Thorstensson H, Falk H, Kuylenstierna J. Periodontal conditions in insulin-dependent diabetics. J Clin Periodontol 1989;16:215-23. Lalla E, Cheng B, Lal S, Kaplan S, Softness B, Greenberg E, et al. Diabetes mellitus promotes periodontal destruction in children. J Clin Periodontol 2007;34:294-8. Collin HL, Uusitupa M, Niskanen L, Kontturi-Närhi V, Markkanen H, Koivisto AM, et al. Periodontal findings in elderly patients with non-insulin dependent diabetes mellitus. J Periodontol 1998;69:962-6. Williams RC, Offenbacher S. Periodontal medicine: The emergence of a new branch of periodontology. Periodontol 2000 2000;23:9-12. Takeda M, Ojima M, Yoshioka H, Inaba H, Kogo M, Shizukuishi S, et al. Relationship of serum advanced glycation end products with deterioration of periodontitis in type 2 diabetes patients. J Periodontol 2006;77:15-20. Irfan UM, Dawson DV, Bissada NF. Epidemiology of periodontal disease: A review and clinical perspectives. J Int Acad Periodontol 2001;3:14-21. Michaud DS, Joshipura K, Giovannucci E, Fuchs CS. A prospective study of periodontal disease and pancreatic cancer in US male health professionals. J Natl Cancer Inst 2007;99:171-5. Borrell LN, Burt BA, Taylor GW. Prevalence and trends in periodontitis in the USA: The [corrected] NHANES, 1988 to 2000. J Dent Res 2005;84:924-30. Pihlstrom BL, Michalowicz BS, Johnson NW. Periodontal diseases. Lancet 2005;366:1809-20. Genco RJ, Grossi SG, Ho A, Nishimura F, Murayama Y. A proposed model linking inflammation to obesity, diabetes, and periodontal infections. J Periodontol 2005;76:2075-84. Michalowicz BS, Diehl SR, Gunsolley JC, Sparks BS, Brooks CN, Koertge TE, et al. Evidence of a substantial genetic basis for risk of adult periodontitis. J Periodontol 2000;71:1699-707.